The government says employers axed 533,000 jobs in November, the most in 34 years, and the unemployment rate rose to 6.7 percent. The loss of 533,000 nonfarm payroll jobs shows the crucial employment market deteriorating at an alarmingly rapid clip, and handed Americans some more grim news right before the holidays. "Our economy is in a recession," Mr. Bush said flatly, speaking to reporters on the South Lawn. "This is in large part because of severe problems in our housing, credit and financial markets, which have resulted in significant job losses." But Mr. Bush said government actions are helping credit to start flowing again. "A market that was frozen is thawing," he said this morning. "There's still more work to do, but there are some encouraging signs." While repeatedly listing the serious problems in the economy, the White House has refused to embrace the actual term until Monday, when a panel for the National Bureau of Economic Research said the recession began last December and is ongoing. Reacting to the jobs report, which showed a jump in the unemployment rate to 6.7 percent (a 15-year high), Mr. Bush expressed deep concern for Americans who have lost jobs, but also said there are some encouraging signs about the credit markets. "There is still more work to do," he said. "My administration is committed to ensuring that our economy succeeds." At 12 months, the current recession is already the longest since a severe 16-month slump in 1981-82. Many economists say this downturn will ultimately set a new record for the post-World War II period. During President Bush's eight years in office, the United States has fallen into two recessions. The first one started in March 2001 and ended in November of that year. Following the report, major indexes on Wall Street were down more than 2 percent and the Dow Jones industrials fell more than 200 points. The loss of 533,000 payroll jobs was much deeper than the 320,000 job cuts economists were forecasting. 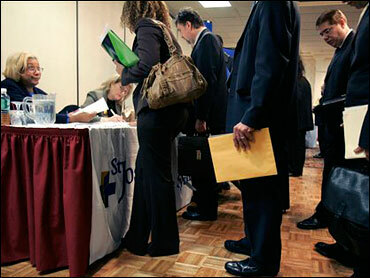 President-elect Barack Obama says today's dismal November jobs report is more proof that forceful action is needed. At the same time, he warned that "there are no quick or easy fixes" and said "it's likely to get worse before it gets better." Obama says the tough times provide an opportunity "to transform our economy to improve the lives of ordinary people." Job losses were widespread, hitting factories, construction companies, financial firms, retailers, leisure and hospitality, and others industries. The few places where gains were logged included the government, education and health services. The pace of job losses is also increasing, and with the economy in recession, it couldn't happen at a more difficult time, said CBS Early Show National Correspondent Jeff Glor. For hundreds of thousands of Americans, this will be a gut-wrenching holiday season. The economy usually adds about 300,000 jobs in November and December, but this year economists predict it'll lose about twice that much during that period. The carnage - including the worst financial crisis since the 1930s - is hitting a wide range of companies. The consensus seems to be that the unemployment rate - already approaching seven percent - won't stop until it lands around 8. John Challenger, CEO of Challenger, Gray & Christmas, Inc., told The Early Show, "The hardest-hit areas are financial services and banks, housing and construction, automotive. But now we are seeing the recession spread out to areas like consumer products, retail, and even technology." Peter Morici, an economist at the University of Maryland, told Glor, "The unemployment rate will go higher this time then over the last twenty years in previous recessions ... quite simply the problems are more serious." Federal Reserve Chairman Ben Bernanke is expected to ratchet down a key interest rate - now near a historic low of 1 percent - by as much as a half-percentage point on Dec. 16 in a bid to breathe life into the moribund economy. Bernanke is exploring other economic revival options and wants the government to step up efforts to curb home foreclosures. Treasury Secretary Henry Paulson, the overseer of a $700 billion financial bailout program, is weighing new initiatives, too, even as his remaining days in office are numbered. While President-elect Obama has promised to save or create millions of jobs with a massive stimulus plan, that's months (or years) away. Still, the unemployment rate often peaks after a recession has ended. That's because companies are reluctant to ramp up hiring until they feel certain the recovery has staying power. That's not much consolation for Steve Ortiz, who was in real estate. "I'm still in a bit of denial; I don't want to think of myself in that category, but it's real, it's there," Ortiz told The Early Show. "I am part of that category." After working for 21 straight years, he lost a job for the first time four weeks ago. Now, with Christmas approaching, he has a family of four, including a two-year-old daughter, to support, with no current income. "It's a nailbiter," Ortiz told Glor. "You worry because you don't know when the next opportunity is going to come along." Ortiz says he's interviewing, but even if he gets an offer he'll likely take a big pay cut. Economists we spoke with think the worst of the cuts will be in the next three or four months, but they likely won't end until late next year or early 2010 - not good news. The only light in this tunnel is that job numbers usually "lag" behind. In other words, companies get back on their feet, then they hire, which means that changes in employment numbers are the last to be seen.